New year, new festival season. Ultra, EDC, Electric Forest— and sure, Coachella—are all around the corner. Whether you’re a first-timer or seasoned raver, we have some suggestions to help you plan for your next festival. First, there are obvious things like your ticket/wristband, sunscreen, and ID. If you’re in a big group have your rave parents designate the necessities. Let’s be real, every group needs a rave parent. 1). Water bottle backpack: There’s CamelBak, Vibedration, and a ton of others to choose from. This is a #1 priority. 2). A Spraying Water Bottle. It is so easy to overheat. 3). BoomBoom Inhalers or the standard option, Vicks VapoInhaler. It smells good and will give you a nice boost of energy. 4). Fannypack or a waist pack. Difference? Fannypack is a bit chunkier and good if you’re bringing more stuff. Waist packs are more form-fitting and typically used for running so there isn’t as much space. Both are ideal for festivals, especially if you don’t want to wear a backpack. 5). Cash. Technical difficulties are bound to happen. Also, tip your bartenders and the concession stand workers. They are doing the Lord’s work. 6). Extra socks. Mud, sweat, rain…Consider bringing a backup. 7). Baby wipes: Port-a-potties tend to run out of TP…and it’s refreshing for your tush. 8). Portable Charger. Don’t let your phone ruin your day – keep it charged. 9). A Watch. If you happen to forget your portable charger and your phone dies, having a watch is a godsend. Also, if you have a FitBit consider bringing that. Get those steps in. 10). Bandana — but make it fashion. 11). Deodorant. Seriously, bring it. You know who you are. 12). Ear Plugs. It might not look ‘cool’ but just do it. There’s only so much your eardrums can take. 13 & 14). Comfy Shoes and Breathable Clothes. Denim isn’t the best idea. Consider shorts, joggers, Spandex, crop tops, tie-dye tanks, or whatever you think is cute/looks good. Raves are all about freedom of expression. It’s a safe place to bring out the crazy in you and not feel judged. 15). Totems (if allowed). Totems usually have a height restriction, which can be frustrating because it sort of defeats the purpose. However, there are ways to get around the limitations. Find the industrial designer in you. Kandi. PLUR. We all remember receiving our first Kandi. It’s a special moment. Share that experience. Pass along the good vibes. Markers to write on backpacks or shoes or however you want to remember this event. It could come in handy. Glitter! Sure it never comes off, but it’s fun! Although you’re not necessarily going full-on survivor mode, you do have to be prepared. 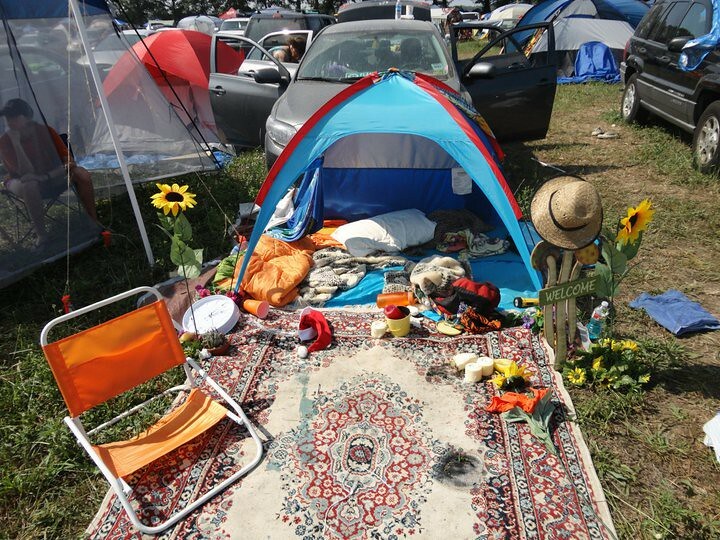 We love a good camping festival. There’s a stronger sense of community. Maybe because you’re all nasty and skip showers (Again, deodorant). 1). Tarps. Important for any camping trip. Bring an extra. 2). Banners/Flags/Totems. You’ll need these to find your way back to your campground. Plus it makes your campsite cozy. It’s supposed to feel like your home away from home. 3). A warm sleeping bag and/or an air mattress (as well as pillows and blankets). You want your tent to be as comfortable as possible. After a day of raving, you are going to be nasty and tired and possibly cold depending on where you are. A comfortable sleeping situation will go a long way. 5). A Cooler: If you have money to drop on a Yeti, by all means, do it. They will last a lifetime. We do have some friendlier-priced options. There’s even this backpack-turned cooler if you’re trying to keep things light. Shameless plug incoming. We’re launching our own shirts with Sub Label for festival season. You can pick up yours by clicking the photos below! You’re all adults. Don’t be dumb and have fun.